Kingston indie co Cellar Door Project rehearsing Tall Ghosts & Bad Weather (2015) in a cemetery. Photo by Angela Maxwell. This article is written by the only working indie theatre artist in Kingston. There used to be two of us but he spends most of his time in Toronto these days. We’ve got three professional theatre companies, resources out the wazoo, experienced mentors that are generous with their time, but for the life of me, I can’t find collaborators. Being an indie artist is different than being a theatre student or an artist with an established career. Most indie artists are recently graduated, employed in joe jobs, and at least in my experience, the work is quick and dirty. It’s mounted wherever there is room and as a result the work is, as Kelli Fox put it in her SpiderWebShow Thought Residency, “risk-perverse”. I’m not worried about losing subscribers or offending an audience because my articulation of my practice is being strung together live as I’m creating. If I’m not working in a bar, coffee shop, or book-store, I’m working contracts in theatre administration to pay the bills. I’ve spent the better part of my professional life on the VIA corridor. Because Kingston’s major theatre, The Grand, only sees between 3-5 theatre shows in a year, I spend most weekends on a plane, train, or automobile in order to engage with live performance in a bigger city. I’m not always seeking shows in big houses, but I’m seeking things I haven’t seen before. Although there is loads of work being done in Kingston by students and community theatre groups, it’s no surprise that if I’m trying to catch theatre that is new or nationally recognized, I have to drive at least two and a half hours to see it. Don’t get me wrong, from all accounts Kingston is a great community to settle in as an artist. The downtown is mighty charming, housing is affordable, and audiences are eager to support things that are homegrown. For a small city there are more music and theatre festivals than we know what to do with, and as of recently, we’ve established a stop on the Fringe circuit. It’s clear we’ve got the resources and the rooms, we just need people in town to fill them. But I think the secret might be getting out. SpiderWebShow Artistic Director and Toronto Dad Michael Wheeler is relocating to Kingston with Zoe Sweet, Fevergraph’s moving-and-shaking Artistic Director. Musical Stage is workshopping a new Fringe musical at the Thousand Island Playhouse and this year, the city will host SpiderWebShow’s festival of live digital Art in a new $72 million dollar performance facility, the Isabel Bader Centre for the Performing Arts. The Concert Hall at Kingston’s Isabel Bader Centre for the Performing Arts. Photo from N45 Architecture. Although these initiatives are real markers of how this community will participate more vibrantly in the #cdncult community moving forward, how are emerging and indie artists invited to engage with them in a city that is taking big steps for big ideas with big money? Arts communities in small city centres are expanding with professional theatre artists leaving Toronto, but it is vital that indie artists from the community get in on the ground. As Kingston arts workers invest in endeavours that attract nationally recognized artists, supporting indie energy will ensure locally produced work is also considered when presenters and programmers are looking to fill a million dollar facility. In small cities, this “indie energy” is integral to developing a vibrant arts community that is sustainable, accessible, and diverse in artist, audience, worldview, and form. As Kingston seems to be starting from scratch in our development of an indie theatre scene, unless we continue to provide opportunities for local artists to make a go at it, our stages will be solely populated by mid-career artists touring in from out of town. In Toronto, indie companies premiere pieces in storefronts to be eventually gobbled up by mid-size professional companies like Factory or Soulpepper. This model could be a useful one to adopt in places like Kingston as well. Chasse-Galerie, produced by Toronto’s KABIN Theatre/Storefront eventually ended up mainstage at Soulpepper. Photo by John Gundy. Artists in similar sized cities are hopeful for a local indie arts renaissance. In Michael Kras’ Intermission article “The Rise of Hamilton (the City not the Musical)”, he credits the Hamilton Fringe for igniting an indie movement in the old Steeltown, acknowledging that, like Kingston, as established artists flee the big smoke to smaller cities in the periphery, outreach initiatives elevate local voices. Two years ago, Pam Patel wrote about Kitchener-Waterloo’s experience with redevelopment in the arts community. When she first moved to KW, the indie style of producing meant that there were “fewer restrictions on what could or couldn’t happen in a venue” and as sensibilities redeveloped, Patel worried about the artist’s role in gentrification and the loss of the “cool, hip” feel of an arts community that didn’t have any rules. Although we are in early days, it’s clear our fledgling indie community is affecting cultural planning. After all, the Kick & Push Festival, our “alternative theatre festival” was founded because Kingston-based indie artists were interested in staging work in non-traditional spaces. However, as the festival continues to grow, there is a lack of local content. 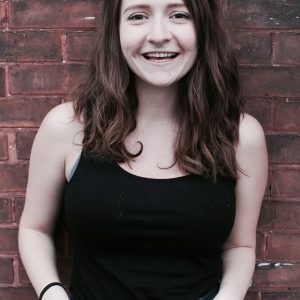 Theatre Kingston’s young Storefront Fringe Festival is taking on this challenge, providing a stage for any kind of creator to make a play and keep the box office, resulting in ad-hoc collectives with professional interests starting to pop up in town. I know I am looking at the beginning of something. As innovators turn to the limestone city to set up shop, I want to be a part of encouraging a local indie scene that shapes major programming and contributes to Kingston’s cultural identity. As festivals and venues start planning their seasons, I hope we can complement the nationally known with the locally grown. Cellar Door Project’s New & Used ft Hannah Komlodi, Audrey Sturino, and I making a play in a record store. Photo by Akhil Dua.